INLAND SEA is a body of water bounded by southern Honshu, northern Shikoku and northern Kyushu. It stretches for 300 miles from Osaka to the resort town of Beppu on northeast Kyushu. The calm, protected emerald green waters are ideal for shipping. The Inland Sea is comparatively shallow, seldom deeper than 1,200 feet. 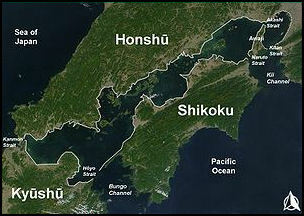 Four major channels connects the Inland Sea to the ocean: 1) the Kanmon Straits between Honshu and Kyushu leads to the Sea of Japan; 2) the Hoyo Strait between Kyushu and Shikoku leads to Pacific; 3) the Naruto Strait and 4) Kitan Strait between Shikoku and Honshu lead to the Pacific. Strong tidal surges in the Hoyo and Kanmon Straits form currents flowing opposite directions that produce whirlpools in the Natuto Straits, between Awaji and Shikoku Islands. The Inland Sea is regarded as one of the most beautiful and peaceful parts of Japan. The most scenic part of the Inland Sea is between Hiroshima, Okayama on Honshu and Takamatsu on Shikoku. This area is blessed with superb coastal scenery, charming farms, slow-paced fishing villages, a mild climate, and over 3000 small volcanic and granite islands. Visitors to this region of sometimes have to pinch themselves as a reminder that they are still in ultra-modern Japan. Many of the people who reside on the Inland Sea live the same way their ancestors did a hundred years ago. But their way of life is quickly being lost. So many young people are moving from the fishing villages and rural communities to the cities that the government is offering them cash, free boats and housing if they come back. Okayama CastleOkayama (about halfway between Kobe and Hiroshima) is small city with about 600,000 people. Okayama Castle, with its four-level donjon, is a 1966 concrete reconstruction of an original castle built in 1573. Yunogo Onsen features natrium and calcium springs and variety of baths, including a cave onsen, rock onsen and kama onsens that resemble large kettle drums. Okayama is also home of the Tsuyama Natural Science Museum, which housed a collection of taxidermic animals, formaldehyde babies and even the internal organs of the museum's founder. Other museums include the Hayashibara Museum of Art, the Okayama Prefectural Museum, the Yumeji Art Museum, the Okayama Prefectural Museum of Art. 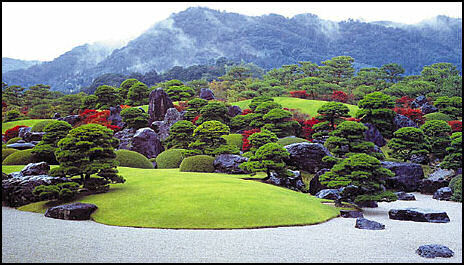 Korakuen Gardens (in Okayama) is one of the three most beautiful landscape gardens in Japan (the other two being Kenroken at Kanazawa and Kairakuen in Mito). Covering 13.3 hectares and built between 1687 and 1700 by the Lord of Okayama, it is a stroll garden with rustic tea arbors, rice paddies, vast lawns, lovely ponds, graceful groves, peaceful hills, lanes and streams---all tastefully arranged to harmonize with the surrounding hills and mountains. Bizen (near Okayama) is famous for its unglazed Bizen-yaki ceramics which have been made for 700 years and are particularly valued by tea ceremony connoisseurs and beer drinkers in izakaya bars because the texture of pottery helps foam to form and allows the foam to last longer. At the workshops on Imbe street visitors can watch craftsmen at work or try their hand at making tea bowls, sake bottles, flower vases, tableware and various other ornaments. Taishakukyo Gorge (2 ½ hours by train from Okayama) is a beautiful spot with a 90-meter-long and 40-meter-high natural bridge with 19 meters of its base submerged under water. 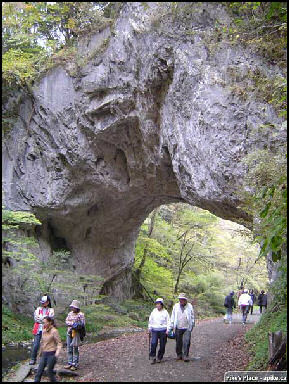 The gorge was carved through 300 million year old limestone by the Taishakukyo River. A hiking trail that follows the gorge passes by a stalactite cave called Hakundi cavern. Lake Shinryu is created by a dam on the Taishakukyo River. Shinryibashi Bridge is longest remaining truss bridge built before World War II. Built in 1930, it is 84 meters long and was 300 meters downstream in 1985. Website: Hiroshima Prefecture Guidebook apike.ca/japan_taishakukyo. 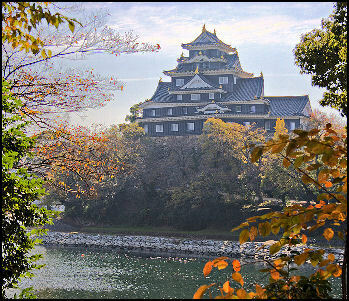 Takahashi (reached by train from Okayama) is the home of highest castle in Japan: Bicchu Matsuyamjo. Located 430 meters above sea level, it lies on the upper reaches of Mount Gagyu. It is about an hour hike to the castle. 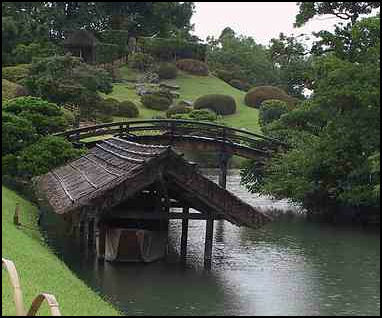 Nearby Raikyuji Temple has a nice garden and some charming samurai houses. 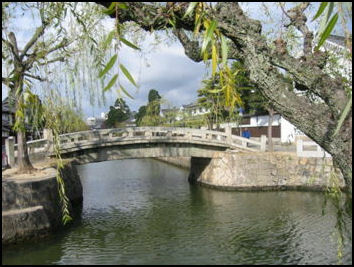 Kurashiki (16 kilometers south of Okayama and 75 miles northeast of Hiroshima) is a former rice shipping port and is now home to 400,000 people and some first rate art museums. Known as a “jewel case of culture,” it contains a small preserved old town with narrow streets, tile-roofed houses, arched bridges, merchant houses, and willow-fringed canals and several large rice granaries which have been converted into museums. Kurashaki means "warehouse village." The nice thing about the old town is that it is separated from the modern town and is refuge from frantic Japanese everyday life. Only a few cars pass along the narrow streets. The biggest distraction are large groups school children and elderly Japanese tourists. The historic district covers 51 acres and embraces 500 or so structures, many of them traditional houses with black tile roofs, white-washed walls and latticed windows. In the old days rice and other foodstuff were brought in from the countryside and stored in the warehouses and then loaded on barges in the town’s canals and floated to the Inland Sea, about a dozen miles to the south. In the 20th century it became a prosperous textile and spinning town controlled by the wealthy Ohara family, who were known for providing good working conditions and benefits for their workers and pouring a lot of their money back into the town by building museums and providing generous funding to hospitals and schools. Sights in Kurashiki: The Kurashiki Folkcraft Museum is located in four two-story granaries. Among the 4,000 items in the museum's collection are ceramics, handblown glass, rugs, fancy mats, straw jackets, woodblock prints, wooden crafts and other folkcrafts. Most of the works are by unidentified craftsmen. Around the museum are traditional-style Japanese houses and shops selling traditional crafts such as pinwheels, mobiles, handmade paper objects, bizenware pottery, and wooden toys. Also worth checking out are the Japanese Rural Toy Museum, Kurashiki Ninagawa Museum (with Greek, Roman and Etruscan antiquities), the Kurashiki Archeology Museum (with Inca, and ancient Persian art), the Savings Box Museum (with a kitschy collection of more than 1,000 piggy banks) and some shrines and temples. In the Antique Mall a wide variety of things are offered in the flea market. Inland Sea Cruises include the popular SKK (Seto Naikakai-kisen) cruises 1) between Miyajima and Ikuchi-jima Island and Ominichi and Omishima Island and 2) between Hiroshima, Eta-jima, Miyajima, and Eno-shima islands. The prices vary between ¥7,000 and ¥12,000 for the day, pending on whether you have lunch or not. Naoshima (in the Inland Sea near Okayama, Kurashiki and Takamatsu) is the home of Benesse Island, a unique art collection that covers the landscape around a guesthouse designed by Tadao Ando. Owned by the head of a large textbook publishing company, the collection included a giant pumpkin set at the end of a dock, a cluster of carved rocks, arranged around a hot tub and a massive salad bowl set by the sea. The hotel-museum is built into the side of a hill. Each room has a wall of glass facing the sea. Other Inland Sea Islands include Inno-shima Island, known for its fruit and flowers; Shiwaku Islands, once a hideout for pirates. See Shodoshima Island and Awaji Island near Kobe. Kure (near Hiroshima) is a former World War II navy base turned into a commercial shipyard and the home to the Yamato Museum dedicated to a famous battleship that was sunk in the East China Sea in what was essentially a suicide mission. The museum contains a 26.3 meter-long. 1:10-scale model of the battleship, a Kairyu midget submarine, a Zero fighter, a Kaiten suicide torpedo, various other kinds of ordnance and artifacts that were salvaged after the wreck of the Yamoto was found in 1985. There are videos of survivors telling their story and exhibits explain how Japan built one of the world’s greatest navies to protect Asia from European colonialism while admitting Japan’s own attempts at colonialism. The museum has welcomed hundreds of thousands of mostly Japanese visitors a year, far more than it creators had anticipated. Onomichi (50 miles east of Hiroshima) is nestled between the Inland Sea and a steep mountainside. Known as the “town of slopes,” it features houses packed together on a maze of steep roads and alleys. There are 25 temples in the town as well as stone monuments inscribed with words from famous writers. Worth a look is the pair of two meter-long straw sandals that hang from Niomon Gate at Saikokuji temple. Shimanami Route (between Onomichi on Honshu and Imbari on Shikoku) is 59-kilometer route employing 10 suspension bridges of varying size that connect the main island Honshu (Hiroshima Prefecture) and Shikoku (Ehime Prefecture) and nine small islands in between. Opened in May 1999, it cost $7 billion and the lives of seven men to build. 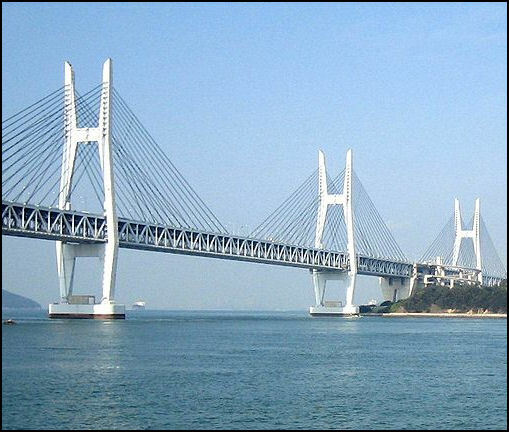 The Shimanami Route included 1) the Tatara Bridge, which connects Ikuchi-jima and Omishima islands and is the world's longest cable-styled bridge, and 2) the 4,045-meter Kurushima Kaiyo Bridge, the first bridge in the world with three suspended sections. Much of the route can be covered by bicycle or by foot on a pathway. The Shimanami Route is the third route linking Honshu and Shikoku. 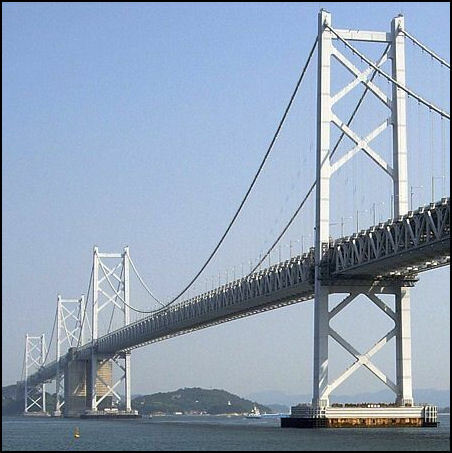 The first was the Seto Ohashi Bridge between Kojima (Okayama Prefecture) on Honshu and Sakaide (Kagawa Prefecture) on Shikoku. The second, the Kobe Naruto route, opened in 1998. 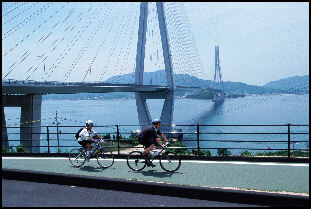 Shimanami Bicycle Route is a 80-kilometer bicycle route that embraces the bridges of Shimanami Route and country roads that parallel the Shimanami Route highway. Visitors can rent bicycle on one side of the route---in either Onomichi or Imbari--- and drop it off at a bicycle shop on the other side. Walks with 3,000 or so participants are sponsored along the same route. The route is an interesting mix of modern Japanese infrastructure technology and bucolic Inland Sea countryside. Riders and walkers can visit castles, shrines, temples, museums, cafes and restaurants. There are also inns and hotels along where people can stay the night. There are stunning views of the sea and the islands from the bridges. Locals like to tell stories about the Murakami pirates that controlled the waters and the treasures the buried. Ikuchijima Island (part of the Shimanami Sea and Bicycle Route) in the Seti Island Sea is famous for lemons. The temperature there rarely drops below freezing which make it ideal for growing lemons and other citrus fruit. The wild boars found on the islands produce meat that has a lemony flavor. 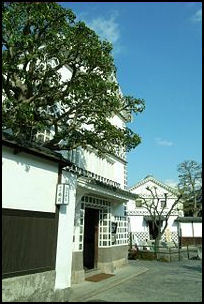 Ikuchijma is also the home of nihonga master Ikuo Hirayama. Seventeen art works are scattered on the island and neighboring Koneshima Island. Other sights include Miraishin no Oka, a 5000-square-meter garden made completely of marble; and the thee-story pagoda at Kojijo temple. Colorful Kosanji Temple is located in the town of Setoda, the island's main town, it was built in 1946 with the private funds of Kozo Kanemoto, a local steel magnate, and features an ornately decorated gate modeled on the Yomeimon Gate at Nikko, a temple modeled after the Hall of Dreams at Horyuji Temple in Nara and a Main Hall inspired by Shitennoji Temple in Osaka. Inside the temple is a collection of Buddhist images and ancient art objects designated as Important Cultural Treasures. The temples greatest attraction, however, is its kitschy 1000 Buddha Cave, which features an tableaux vision of hell with bodies of the damned beginning chopped, burned and mutilated. Omishima Island (200 meters across a channel from the town of Sezaki) is a hilly 10-square-mile island known for its beautiful scenery and armor collection. Buffeted by raging waves, the northern coast of the island contains towering 300-foot-high cliffs, rock tunnels, caves, stone columns and reefs. The "Bridge of Waves" is a huge rock with a cave and a great arch.